Rows of lush paintings and intricate sculptures dot the walls, while carefully arranged collections of jewelry, textiles and avant-garde creations grace the elegantly draped tables. A fashionable woman dressed in a chic, off-the-runway look bustles back and forth simultaneously tending to guests and several buffets. Outside, musicians tune their instruments to get the sound just right for the evening’s performance. No, this is not some fancy gallery opening in New York City’s SoHo District. 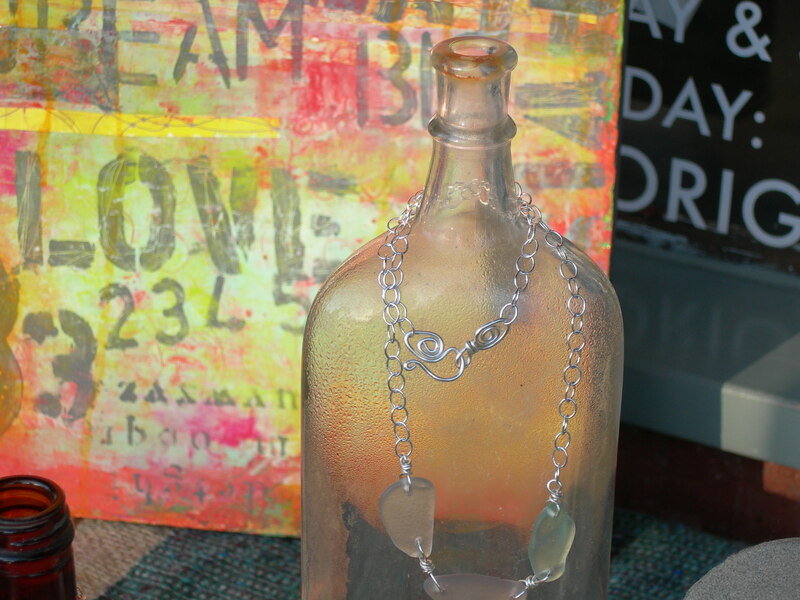 It is the charming atelier, Art N Soul on 101 in the sleepy beach town of Encinitas, Ca., where at least four times a year, the owners, Cindy Blumkin and Paige Perkins, host an open gallery brimming with food, beverages and entertainment. This evening they bid farewell to winter with the Spring Celebration. What sets Art N Soul apart from other galleries and retail establishments is that it gives 100 percent of its profits to charitable organizations, which they rotate about every two years. Neither Blumkin, who is in charge of the business operations nor Perkins, the creative force behind the gallery, draws a salary. The mostly local artists keep 60 percent of what they have sold. The other 40 percent pays the rent, utilities and operating costs. Then, four mostly small, grassroots charities divvy up the rest. 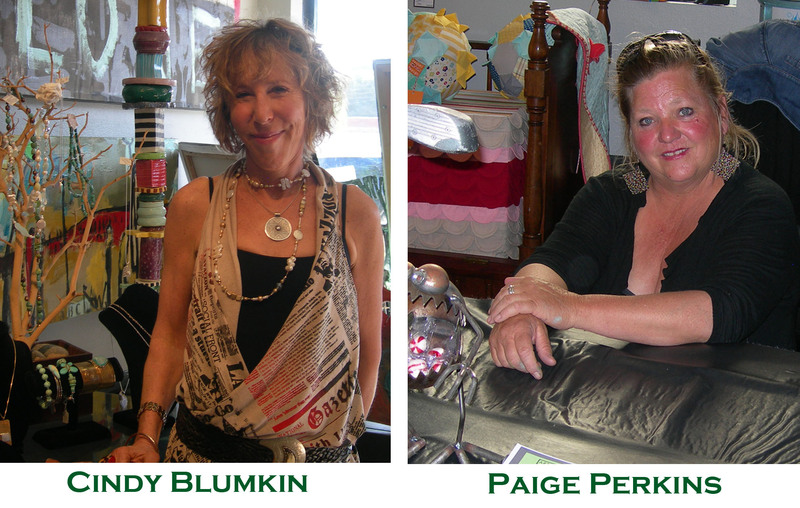 That dream came true in 2007, when Blumkin was finally able to combine her philanthropy efforts, commitment for social change and support for local artists with Perkins’ creative vision for an organic and accessible space that incorporated recycled materials. In their first year of business, Art N Soul raised more than $22,000, which it divided among its first chosen charities. During that time, they also hosted a benefit for a local high school where students held a 24-hour paint-in and then auctioned off their work in the store. In spite of a crippling recession, artists and charities have received about $90,000 to date. Unlike traditional galleries, Art N Soul’s mission is to attract passionate artists whose main wish is to promote their extraordinary, imaginative and sometimes outrageous work. And that art is actually affordable, which makes it easy for those who want to buy a beautiful, one-of-a-kind piece to wear or use in their home décor. Art N Soul has only one rule for the artists: there are no rules. This becomes clear when a trip through the door sets off a visual explosion of shape, color, texture and form that cascades into a colorful array of tactile and uncommon textures. Volunteers who are equally passionate about giving back to the community, staff the gallery; and their stories are just as colorful as the kaleidoscopic art that surrounds them. Take, for instance, John and Sandy Clauder. They have a band called, Drums of Fire, which provides entertainment for Art N Soul’s open-gallery events. That wouldn’t be so unusual except that John, a studio musician, once played with the 60s rock group, The Mamas & The Papas. He also toured with Buffalo Springfield and Nancy Sinatra among other headliners. 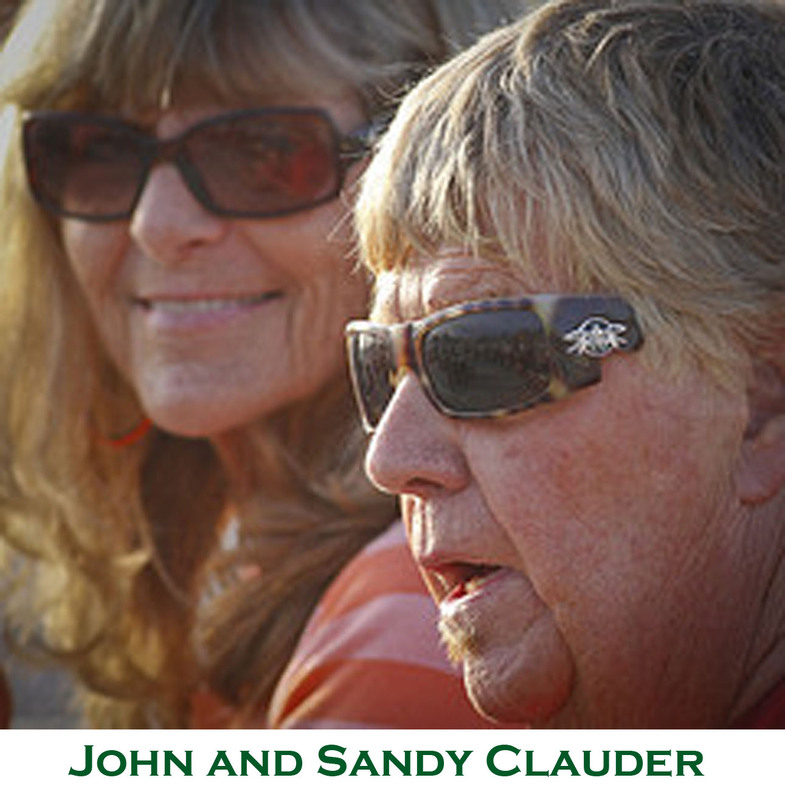 The Clauders met many years ago in Los Angeles on Sunset Boulevard where Sandy was doing Canada Dry commercials. She walked into a nightclub where John was playing at the time and the rest is history. Four years ago, two of their children, Patrick and Nick joined the band. 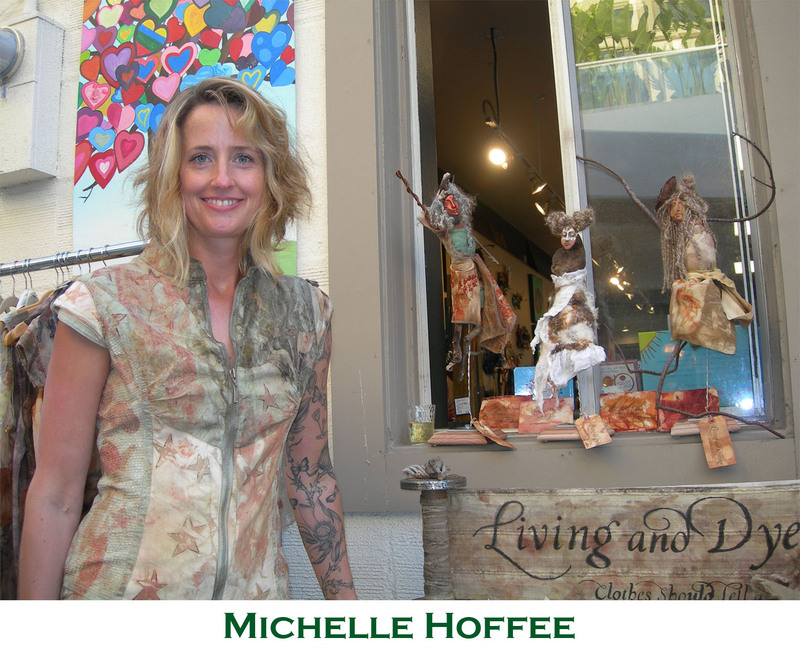 “Clothes should tell a story,” says one of the artists, Michelle Hoffee. Her eco-prints, naturally dyed and handcrafted clothing and accessories hang next to a display that holds her small, captivating sculptures called “spirit dolls” as well as the name of her business, Living & Dyeing. Hoffee, who is a practitioner of reconstructing and upcycling makes her own fabrics using leaves to create the unique designs. And it has been a wonderful experience as well for those of us lucky enough to visit Art N Soul or benefit from their charitable donations. 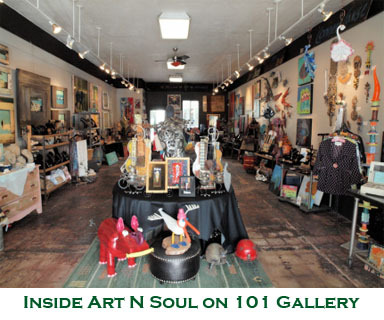 Art N Soul is located at 633 South Coast Highway, Encinitas, Ca. For more information call (858) 442-8666 or visit http://www.artnsoulon101.com. Hours are Tuesday through Sunday, 11:30 a.m. to 5:30 p.m. and during the summer months, extend to include Friday and Saturday, 11:30 a.m. to 8 p.m. Appointments are also available. This entry was posted in Art, California, Galleries, Living, Music, Observations, Travel and tagged Art Gallery, beach, Buffalo Springfield, California, Charity, Living, Los Angeles, Music, Observations, philanthropy, sculpture, Sunset Boulevard, The Mamas and The Papas, Travel, Visual arts. Bookmark the permalink. What a great place! This is why I love Encinitas!